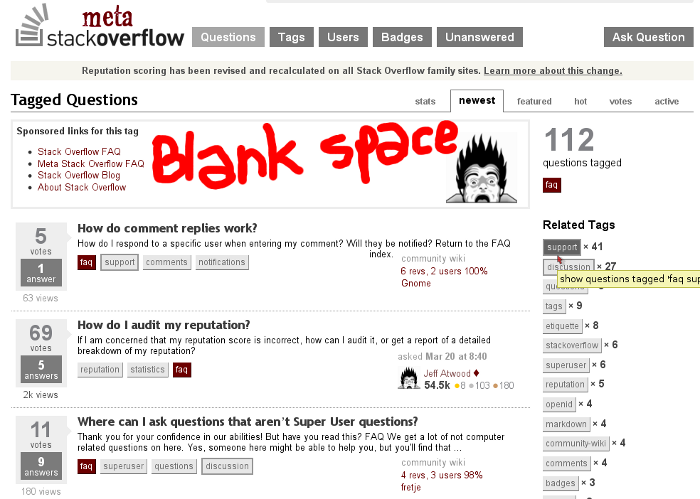 Could SO sponsor the FAQ tag on Meta? If you go to the faq tag here in Meta, you are greeted with the complete list of the sofaq overhaul project. It occurred to me that the team could make the faq tag a sponsored one here on Meta, so it could have on the tag page (in addition to the image, if any - I don't know if it should even have one) a list of links to the FAQ, about pages and maybe the blog. How much does it cost? Should we take venture capital to afford it? edit: we now have a house sidebar ad on the meta home page. I don't think we want to extend this to every page that the sidebar appears on, though. As for the rest of your proposal, I am folding it into Create a tag homepage/FAQ because I think that would be a way for the community to set up those editorial content tag-specific pages rather than us. So transfer the "but it needs to be on the tag page!" votes to the above link. Not the answer you're looking for? Browse other questions tagged feature-request status-completed sponsored-tags . Can we add the “linkbar” to the bottom of all sponsored tags?